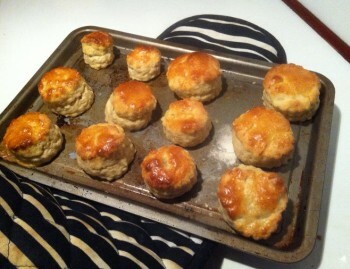 The other evening, I decided to perfect my scone recipe. I�d had a go at cooking them for the very first time on board my boat the week before, and they went pretty well, but I thought I could do better. The second time, I used a little less milk, and bought some cookie cutters to cut them out properly with the jagged edges. Success! Scones mk2 were even better than their predecessors. I cooked up a big batch, and enjoyed eating some with butter and strawberry jam with my friend Emily, who lives on a boat near me, before we went out to play in the snow for a few hours with an awesome sledge her boyfriend Josh had made. Anyway, I digress... my scones even followed me to work the next day - I put three in a tupperware tub, and warmed them up at work under the swanky microwave grill thing (we don�t have toasters because of the fire/smoke alarm risk). Returning to my desk with a plate of scones, jam and butter, a few of my colleagues� eager eyes turned in my direction. It�s almost as if people want me to use the whole �I live on a boat� as an excuse for things. Sorry I look a bit of a mess today, I live on a boat and had to scrub the bilges. Sorry I don�t have my notebook with me, I live on a boat and the wind blew it away. Sorry I can�t come to your party, I live on a boat and couldn�t find an anchorage near your house. Sorry I couldn�t contribute some food, I live on a boat and have a weird cooker. Sorry my car is dirty, I live on a boat and can�t drive the car onto my pontoon to wash it. Sorry I can�t come to work today, my boat has sailed itself away from the dock. Sure, some things about life on board require a few adaptations - like having to get dressed and go to the facilities for a shower instead of rolling straight out of bed into one, and having to plan a trip to the marina laundrette. But there�s not a lot about living on a boat that can�t be overcome, or that doesn�t provide you with more of a sense of enjoyment and achievement than if you�d done the same task ashore. Changing a double duvet, for example, is enough of a pain in a house; but try doing it in a cramped forepeak! So next week, I think I�ll cook up another batch of scones and take the whole lot into work with me to share amongst my friends and colleagues (not forgetting the butter and jam). And hey - I think I might even cook them at sea! That will really have them intrigued.